Graded piano recital repertoire in four volumes, edited by Carole Bigler and Valery Lloyd-Watts. 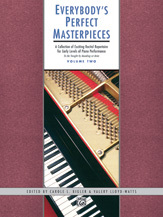 Each volume includes a rich selection of the works of the greatest masters from all eras. Book 2 repertoire is sequenced so that it would range from Levels 2-4 of most piano methods.